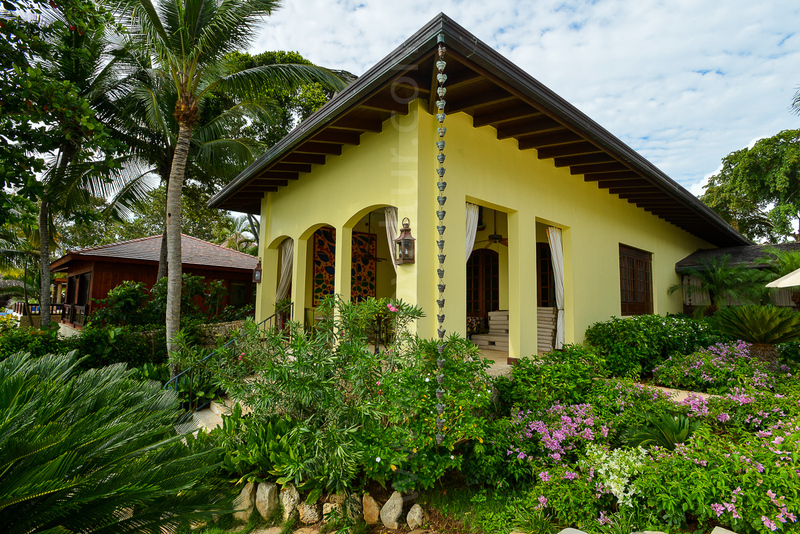 This wide open Balinese-style house boasts 5 bedrooms and 6 baths, beautiful mahogany floors, and great, airy living rooms which open to the oceanfront covered terrace. 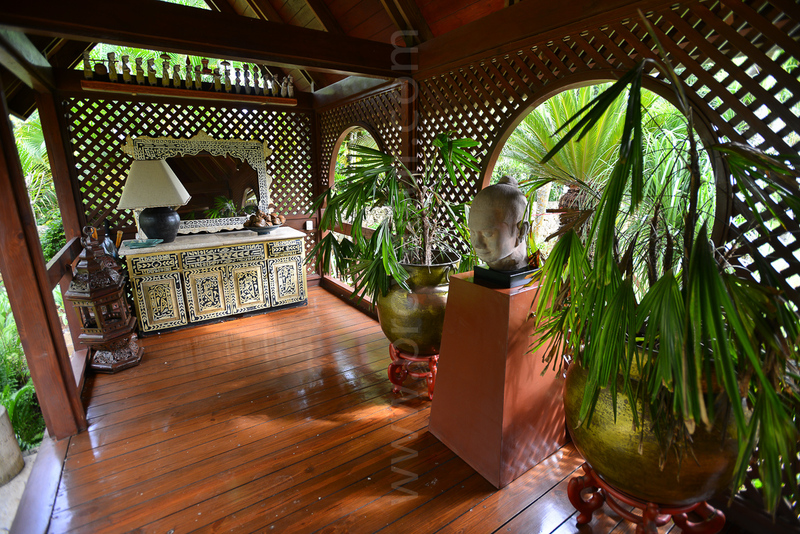 The wood paneled library has lovely builtins and air conditioning. 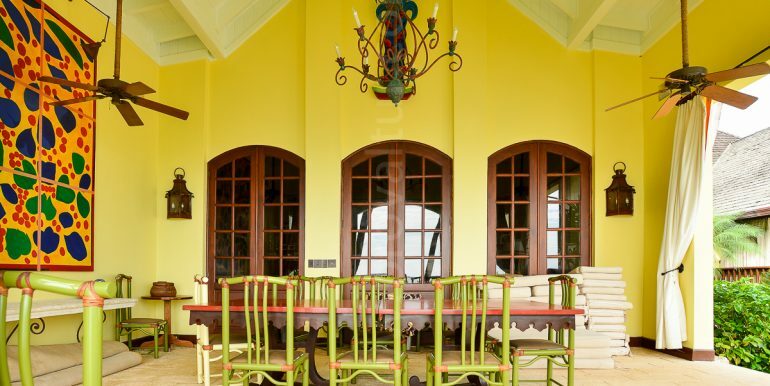 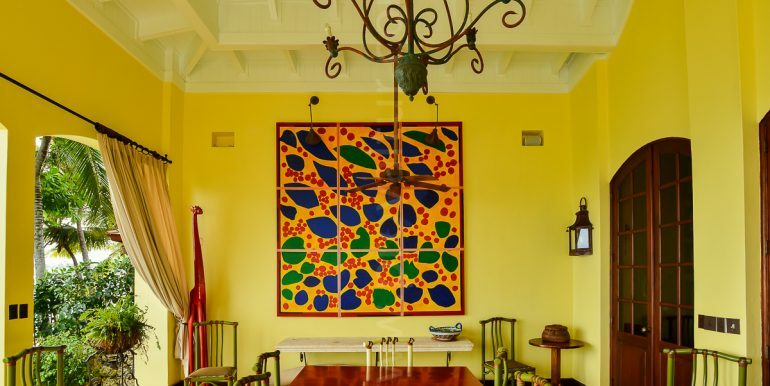 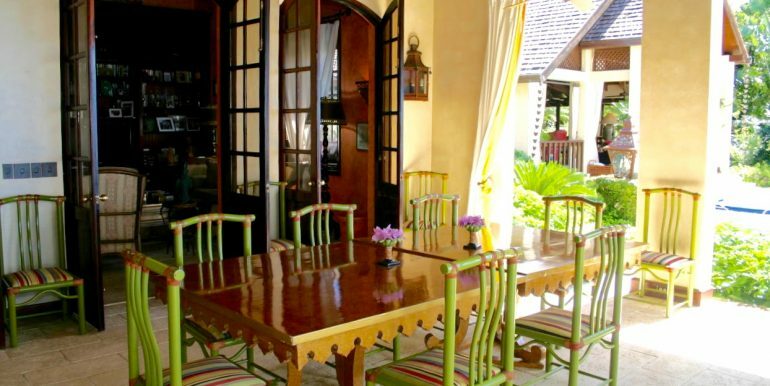 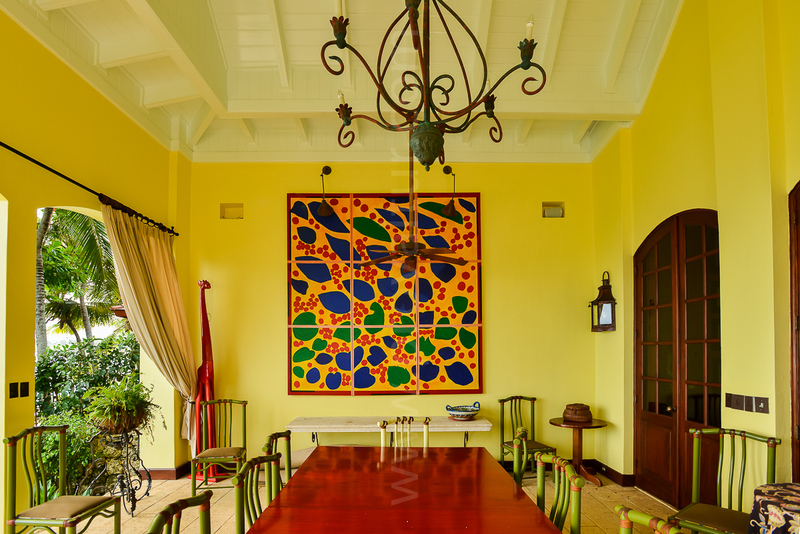 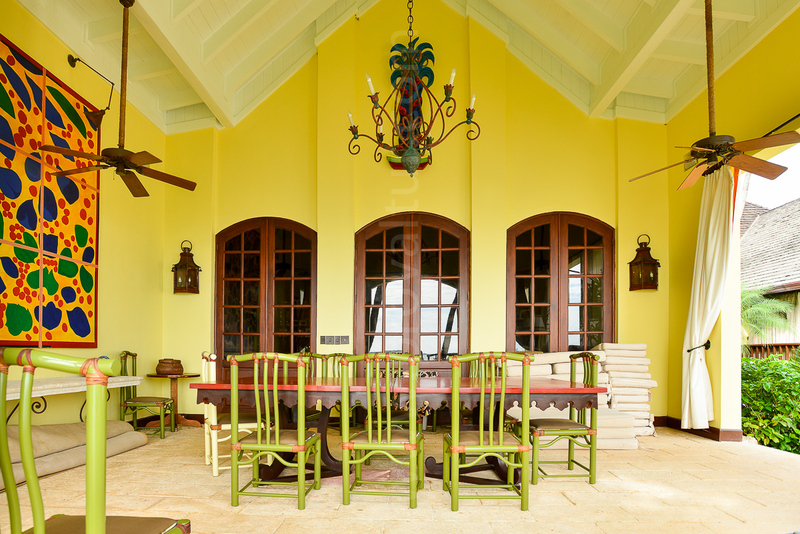 The fabulous dining room opens to the pool, ocean and large property. 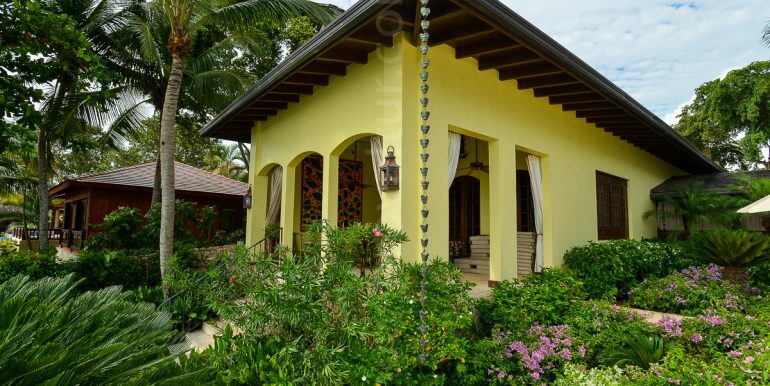 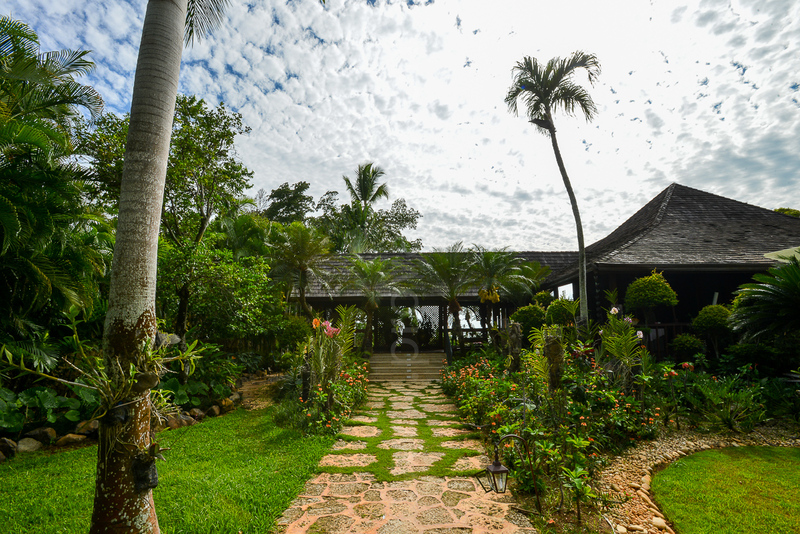 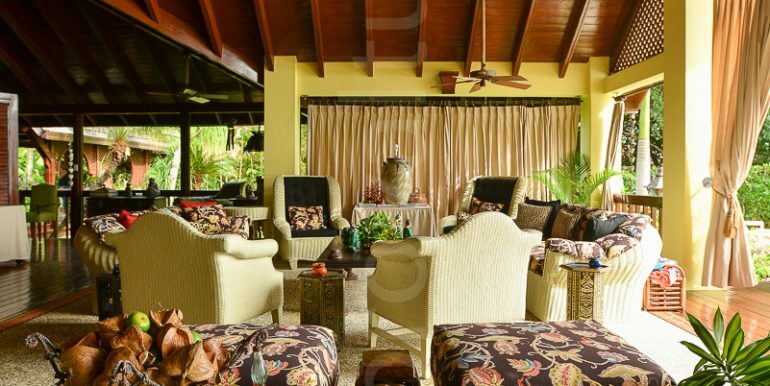 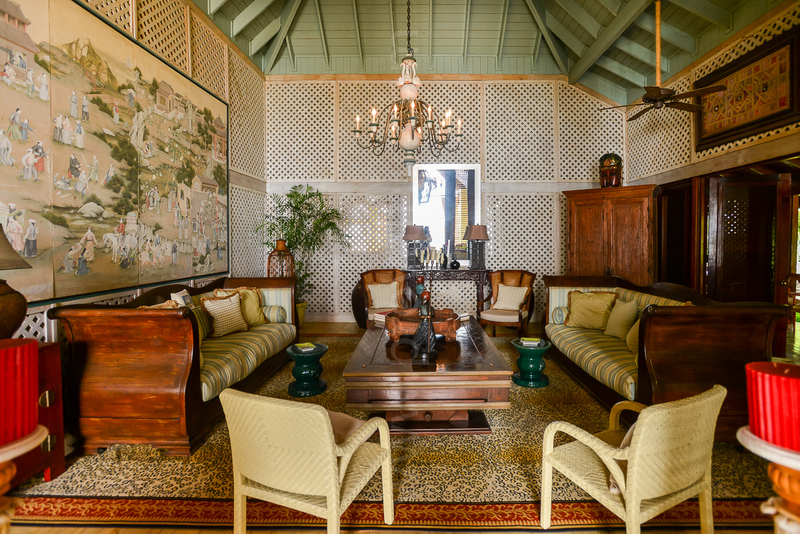 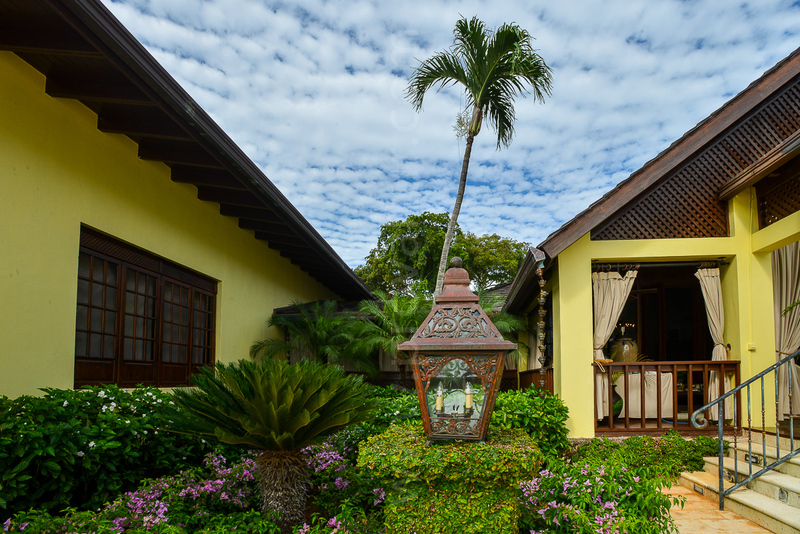 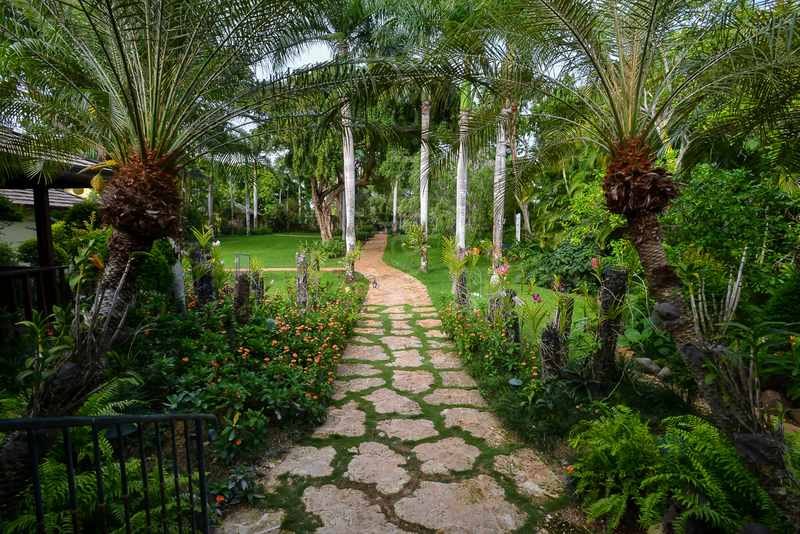 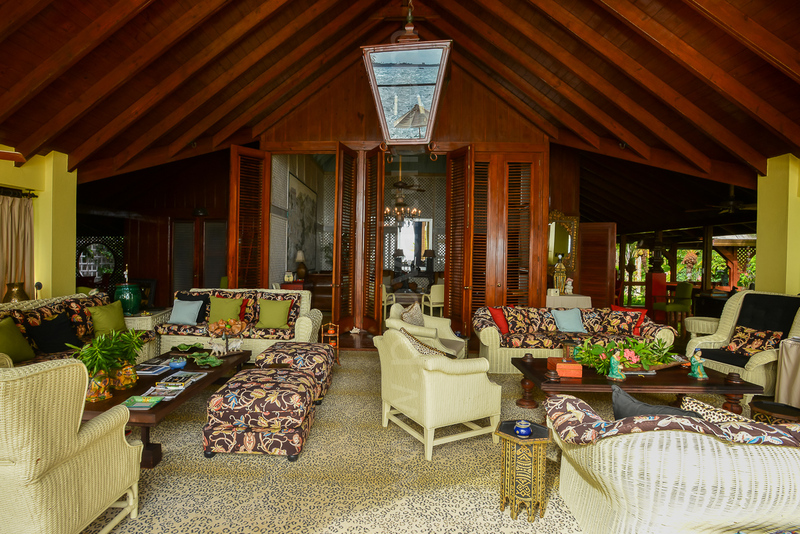 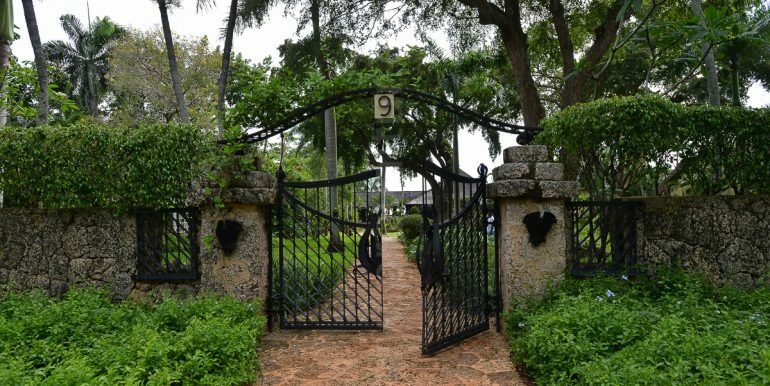 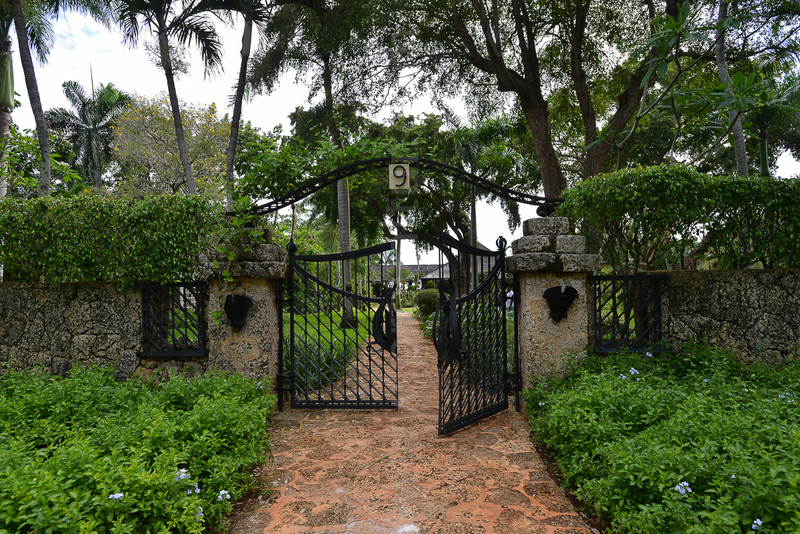 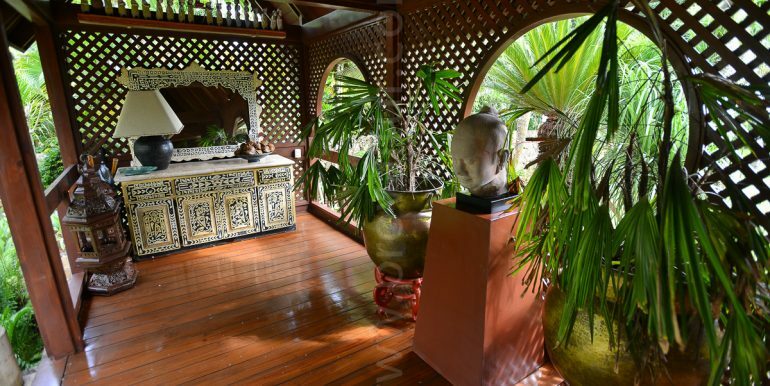 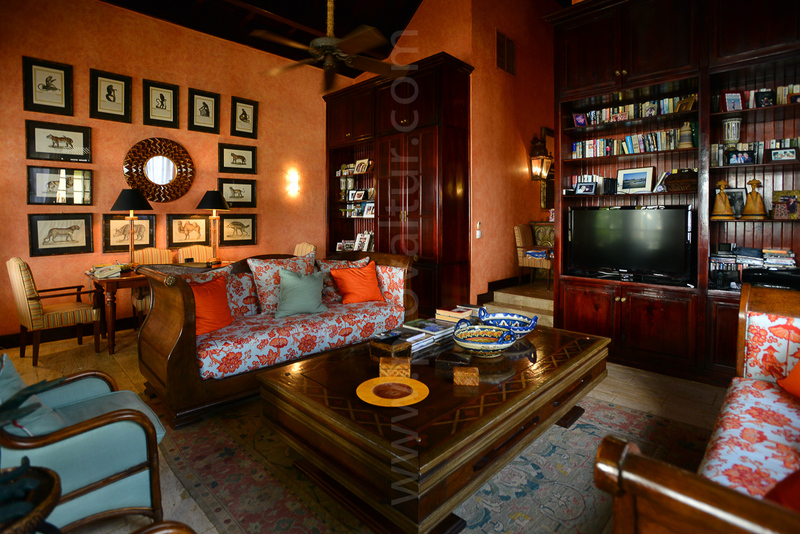 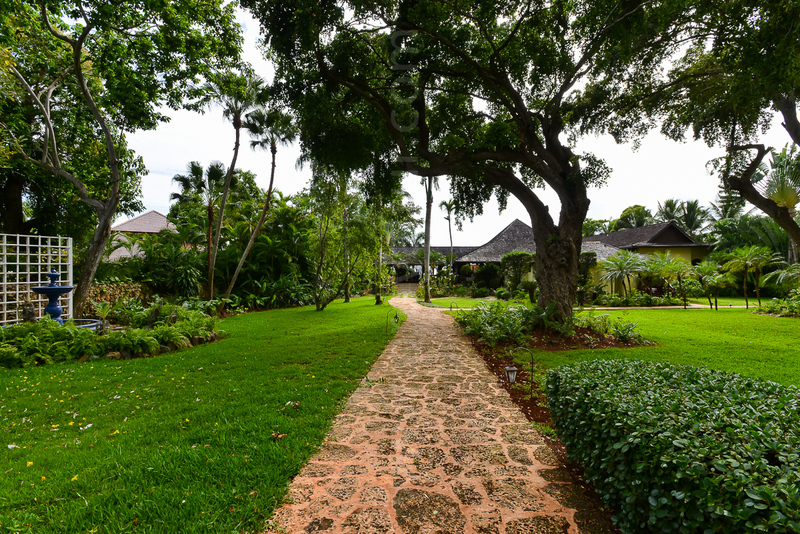 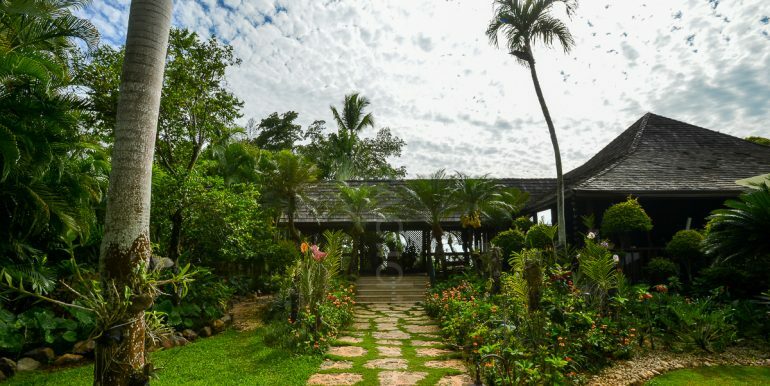 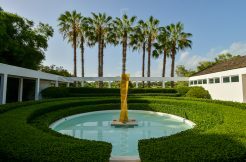 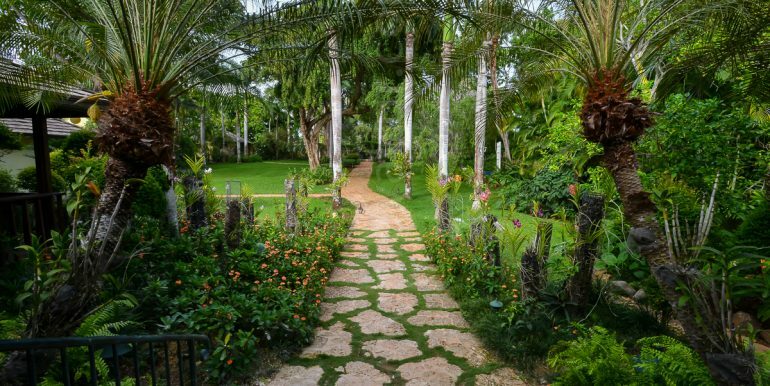 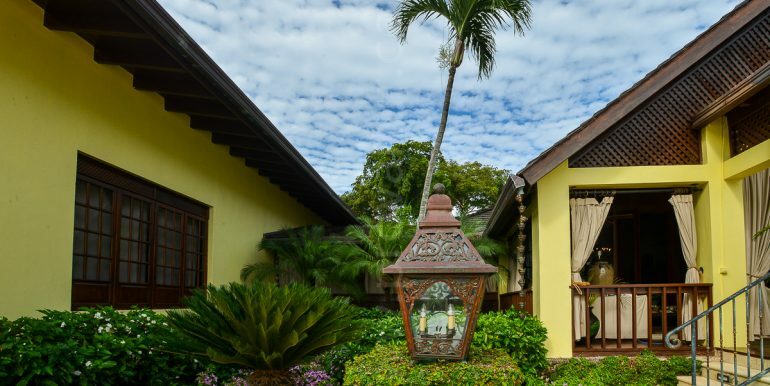 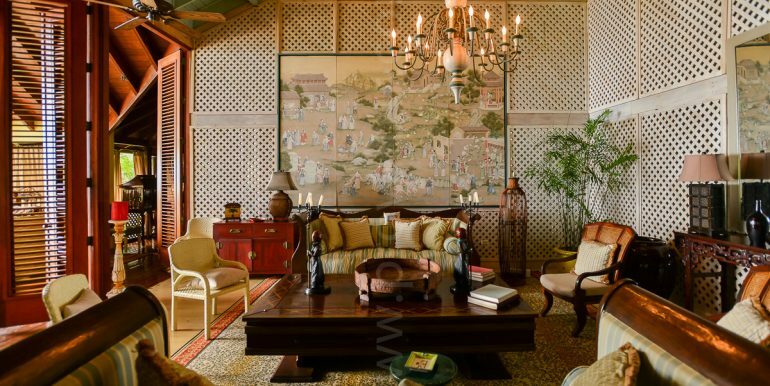 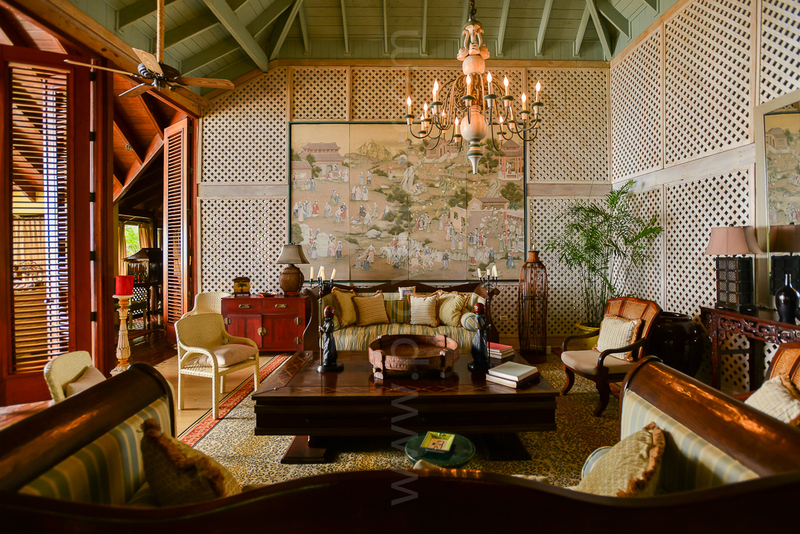 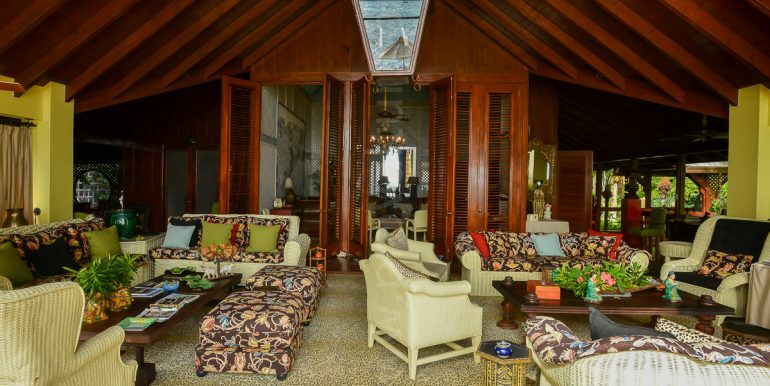 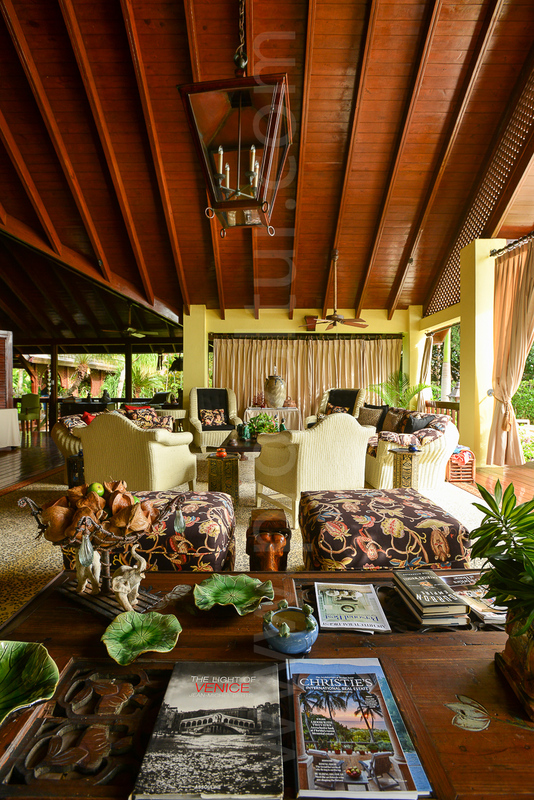 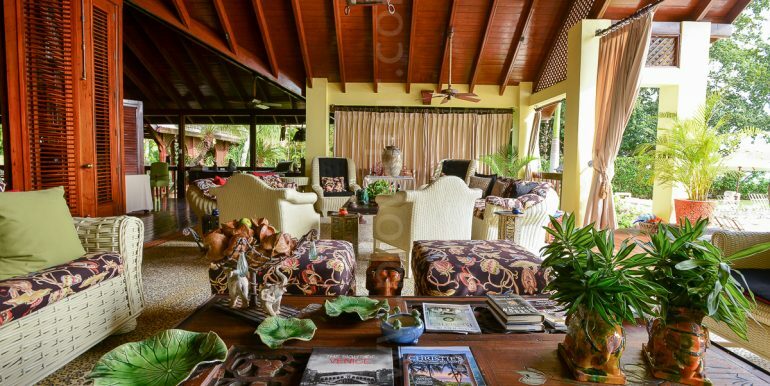 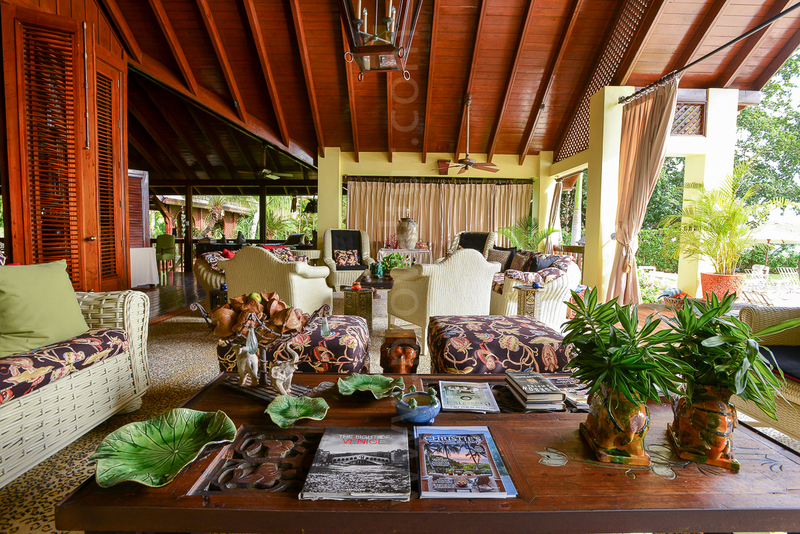 The home’s enchanted tropical garden surrounds the entrance and guest bungalow. 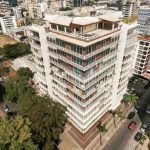 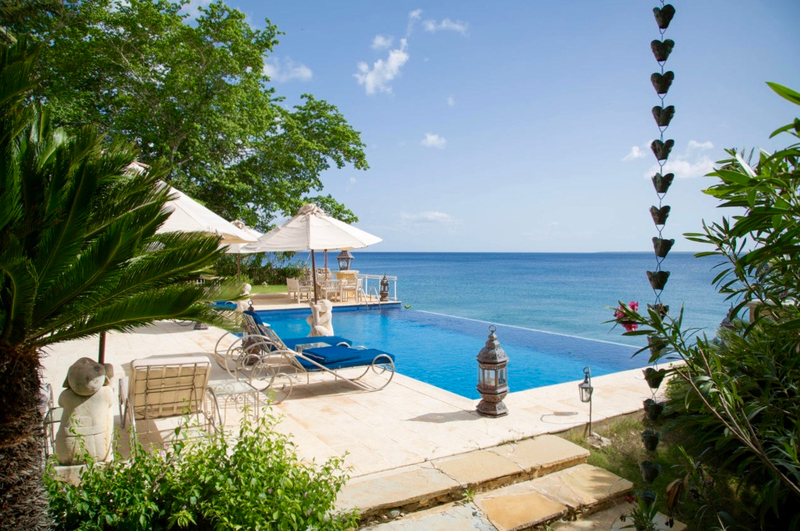 Whether you prefer to relax by the pool, on the terrace or in the air-conditioned living room – the sound of the ocean will reach your ears and it will always be within your line of sight. 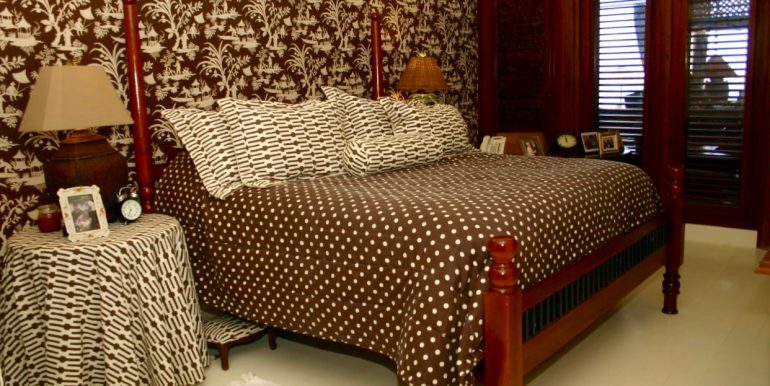 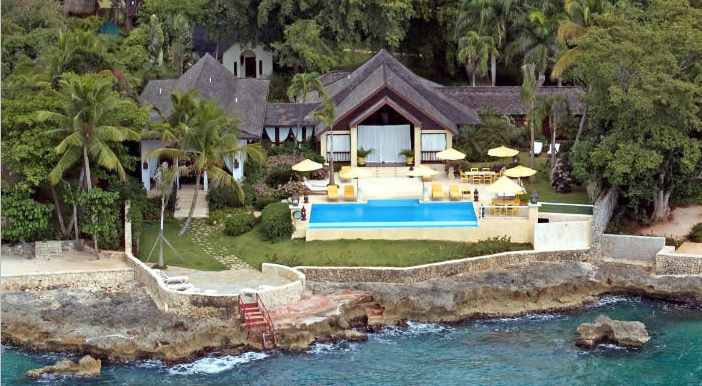 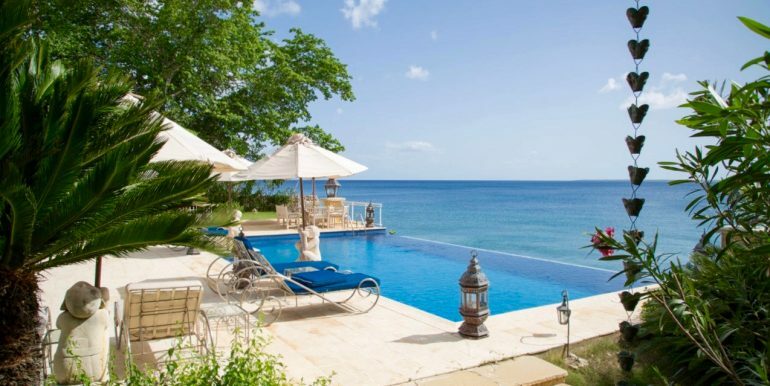 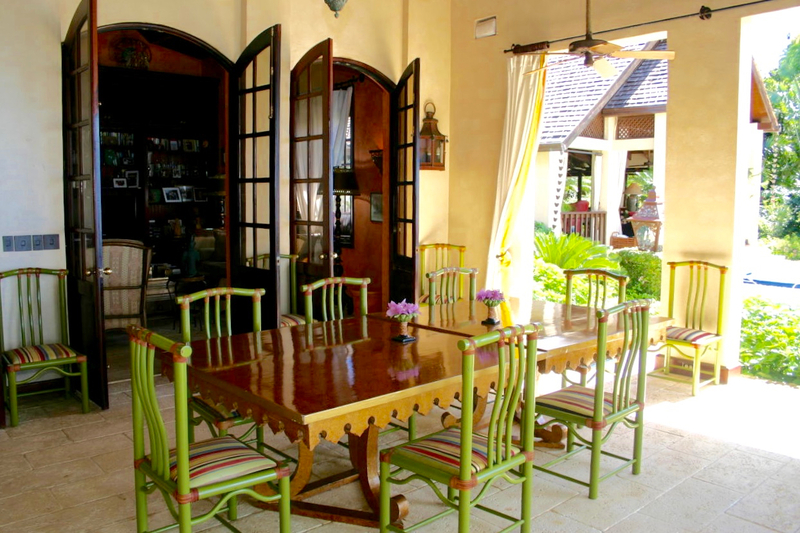 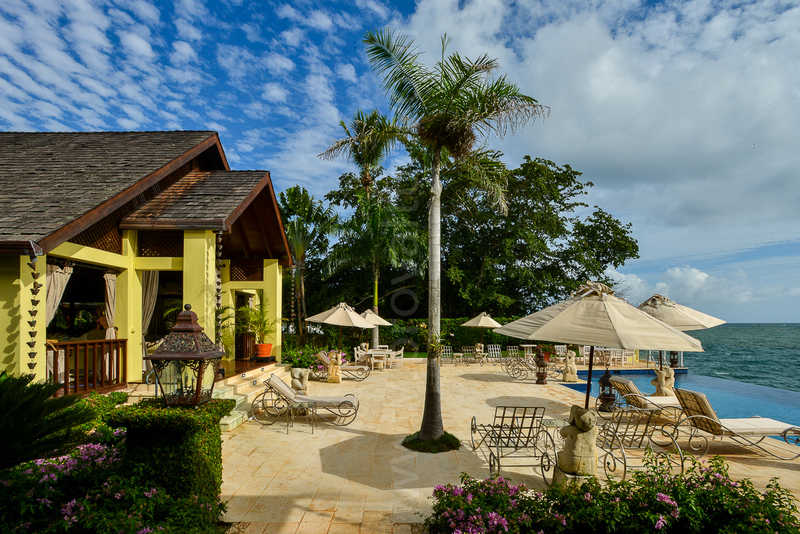 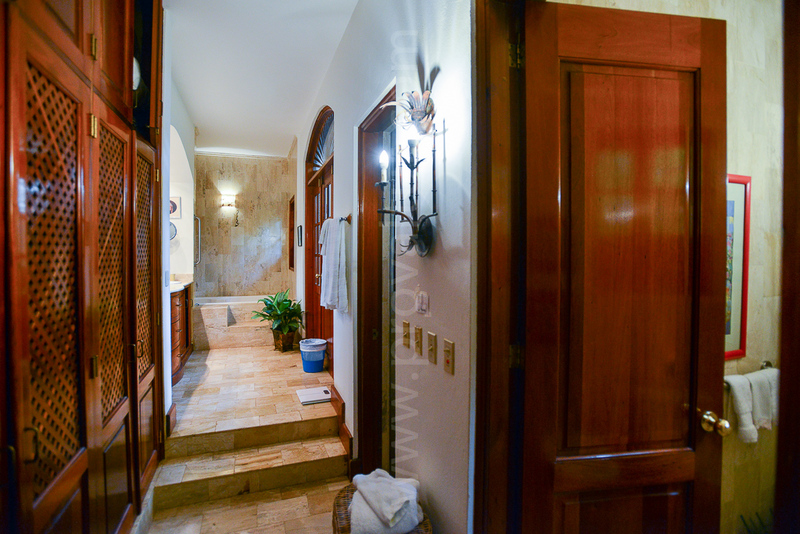 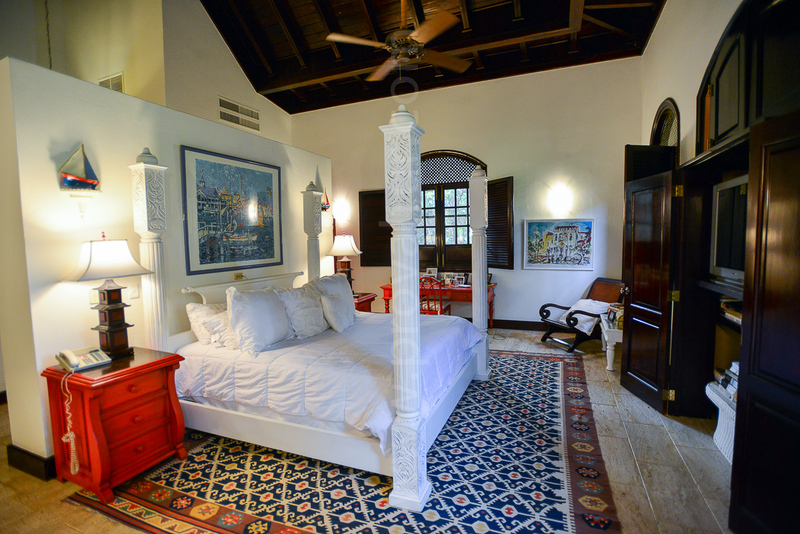 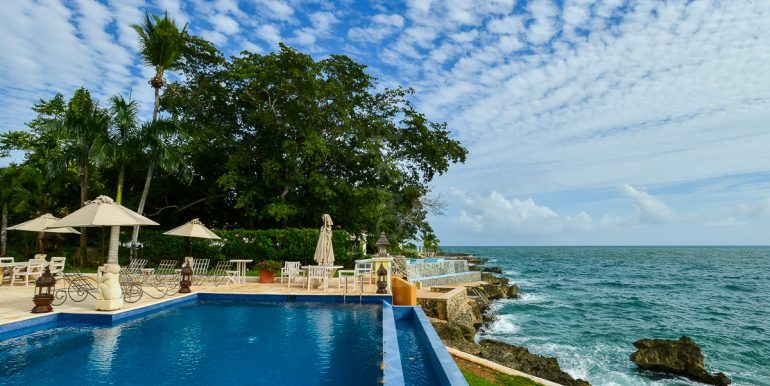 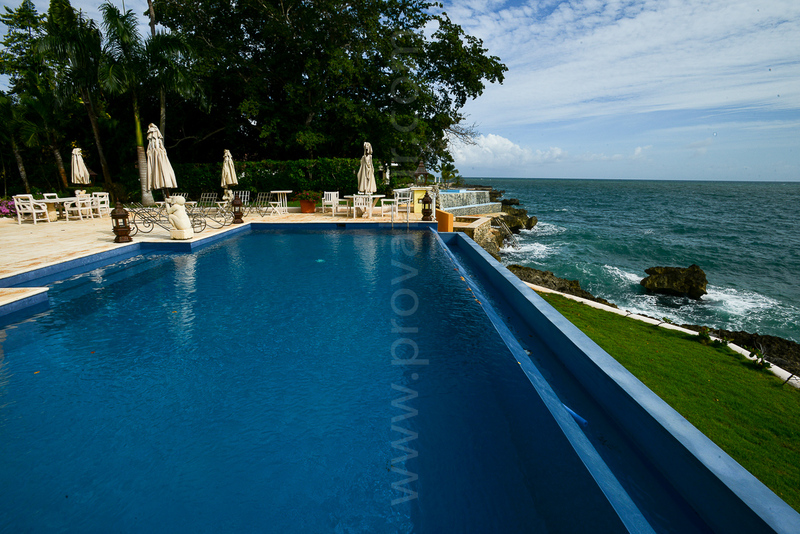 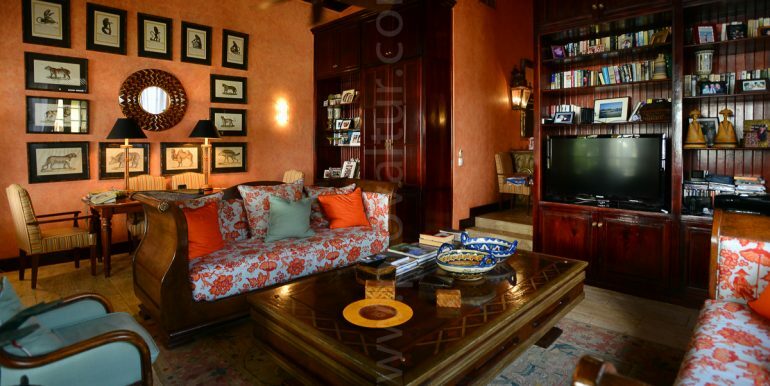 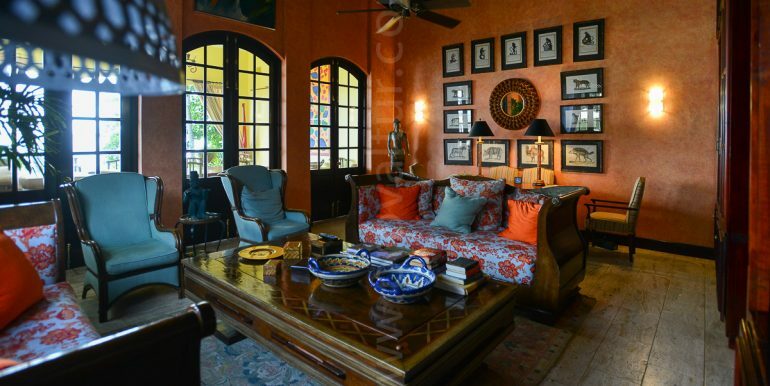 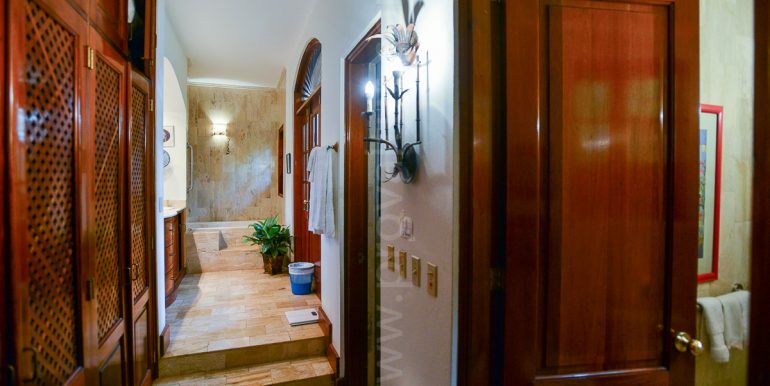 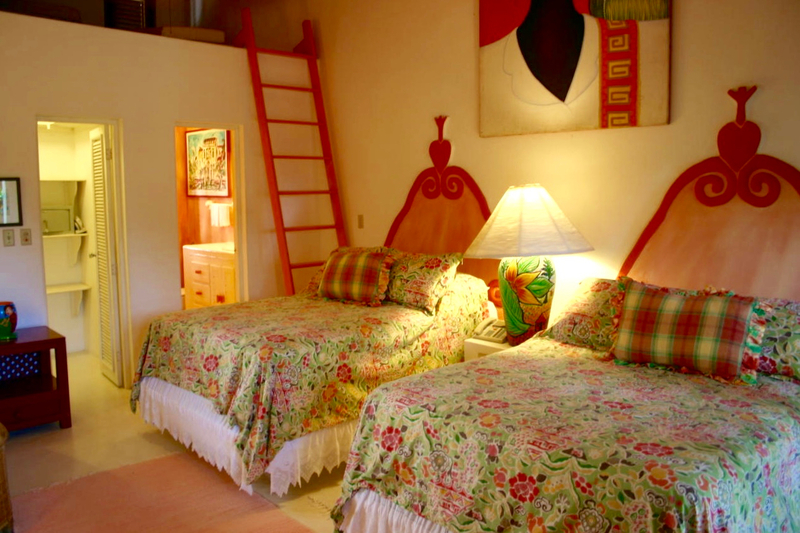 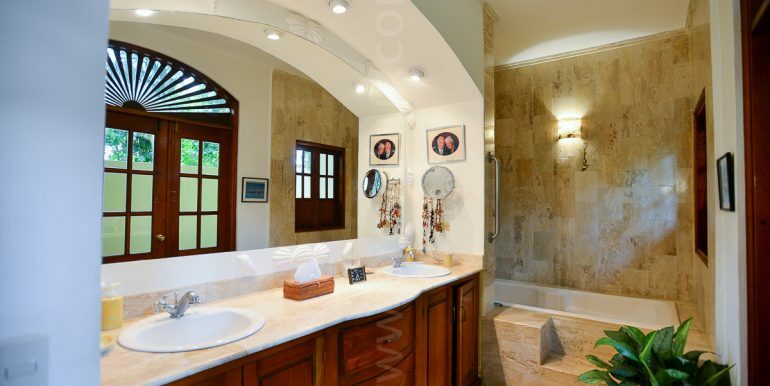 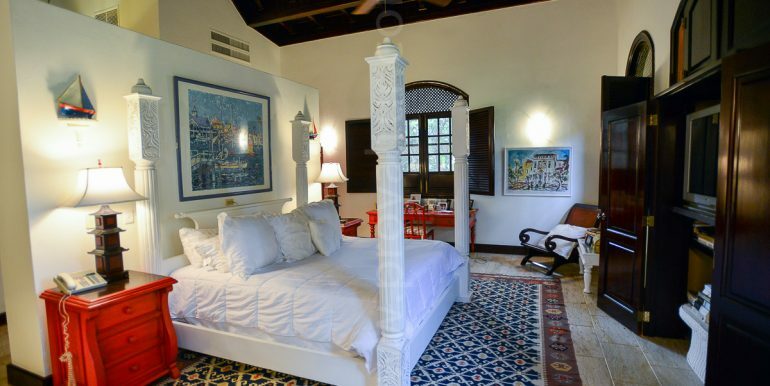 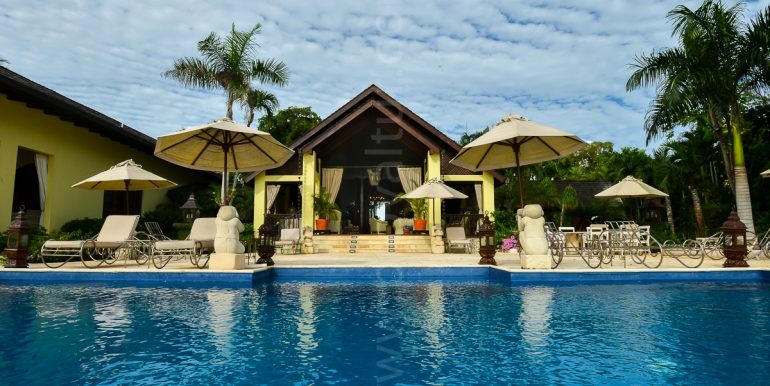 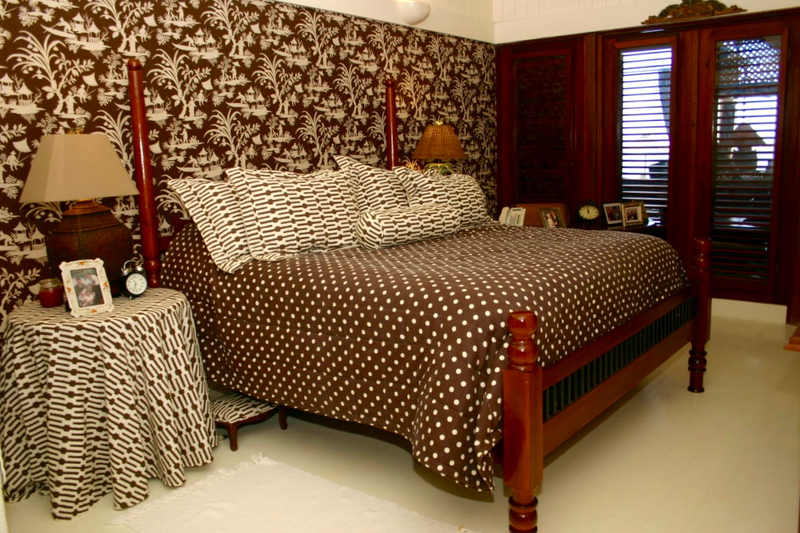 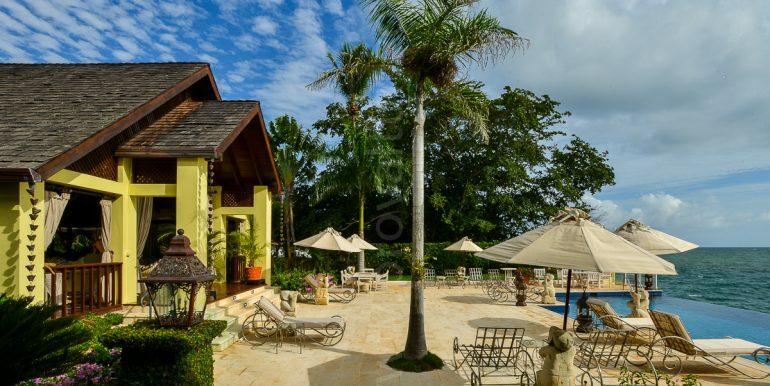 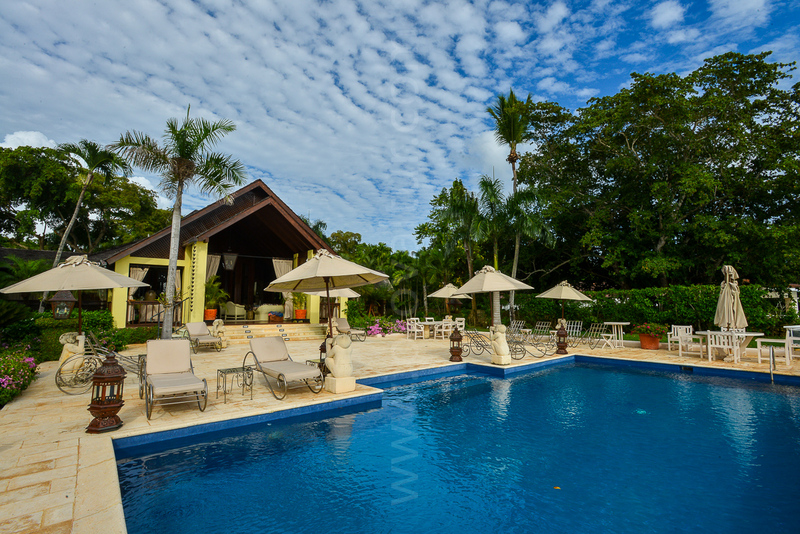 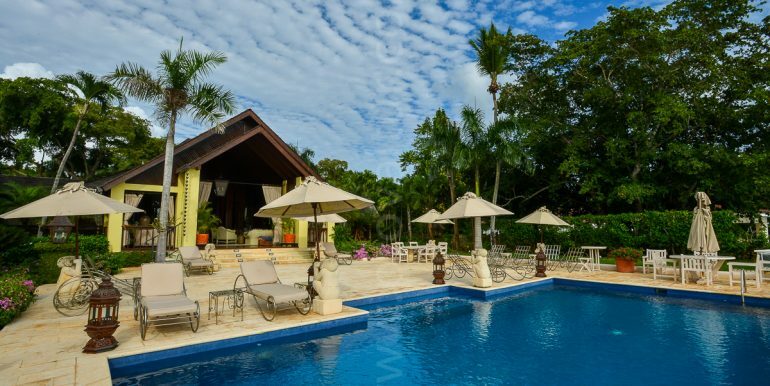 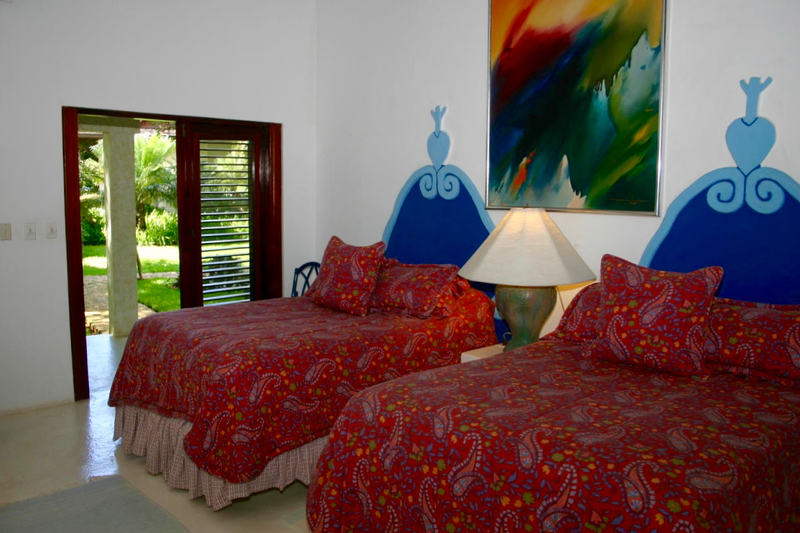 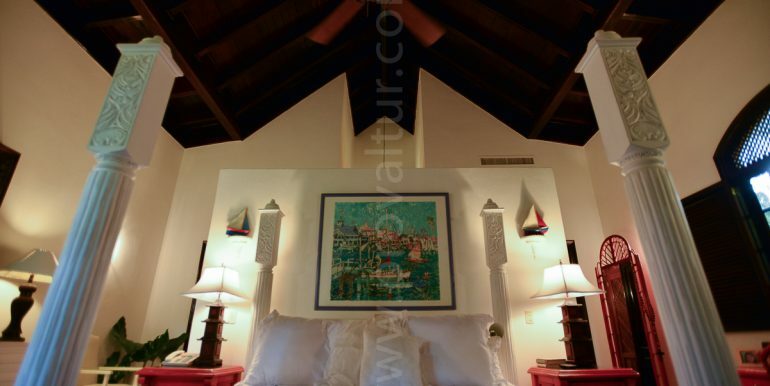 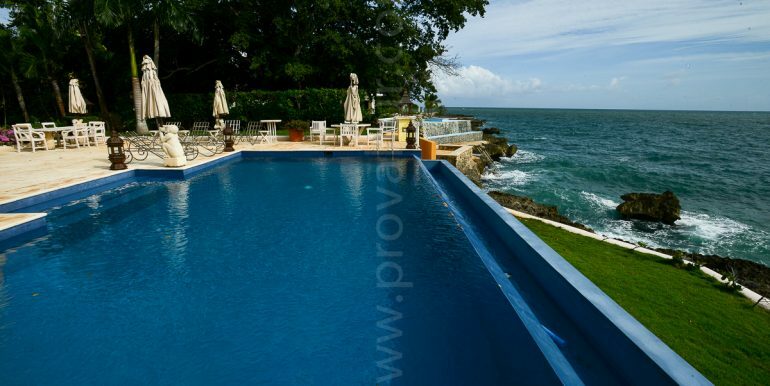 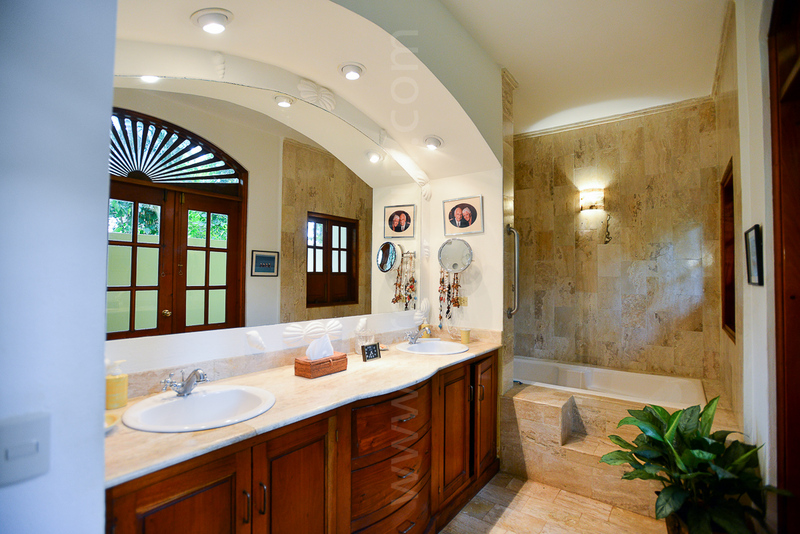 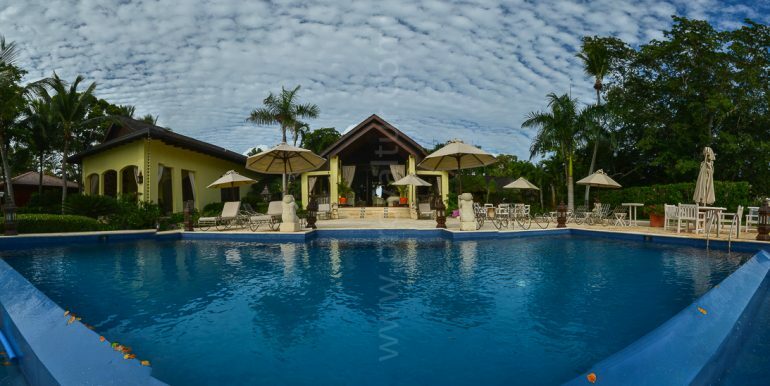 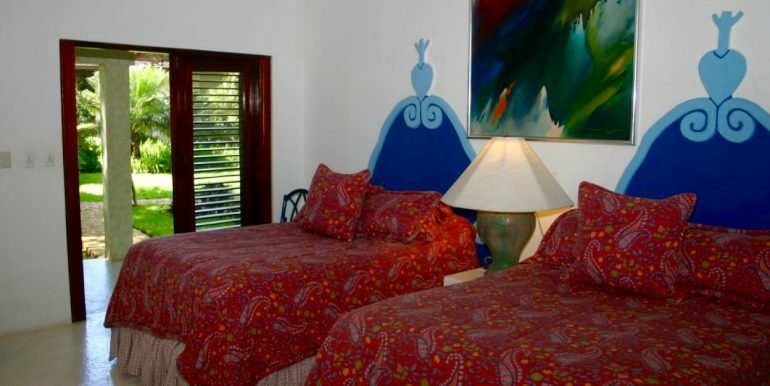 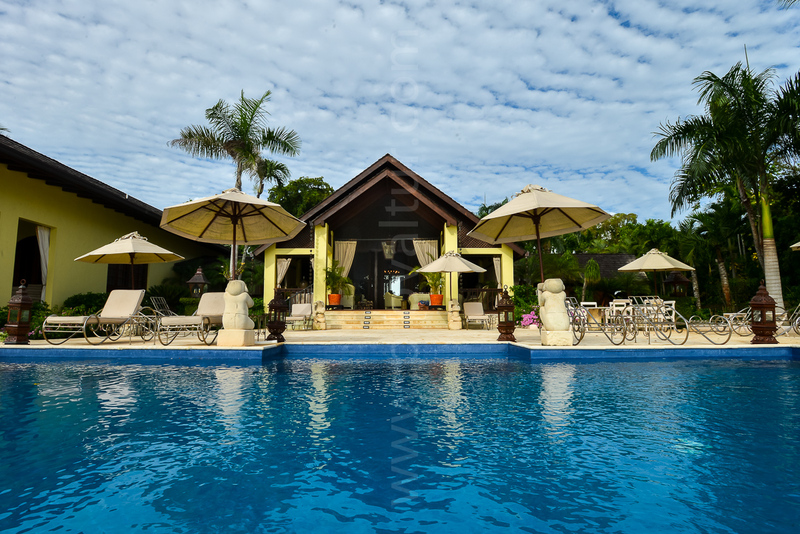 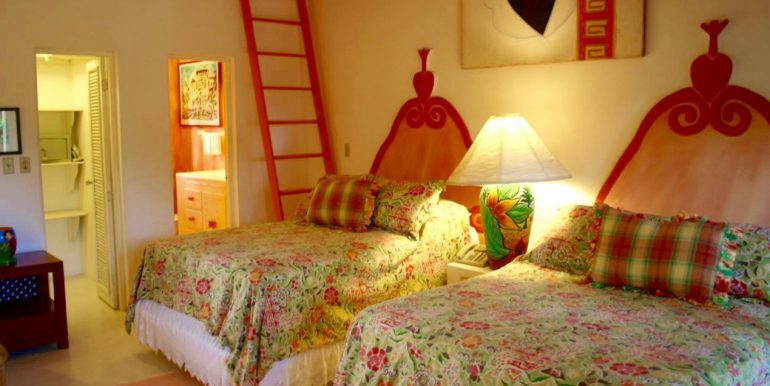 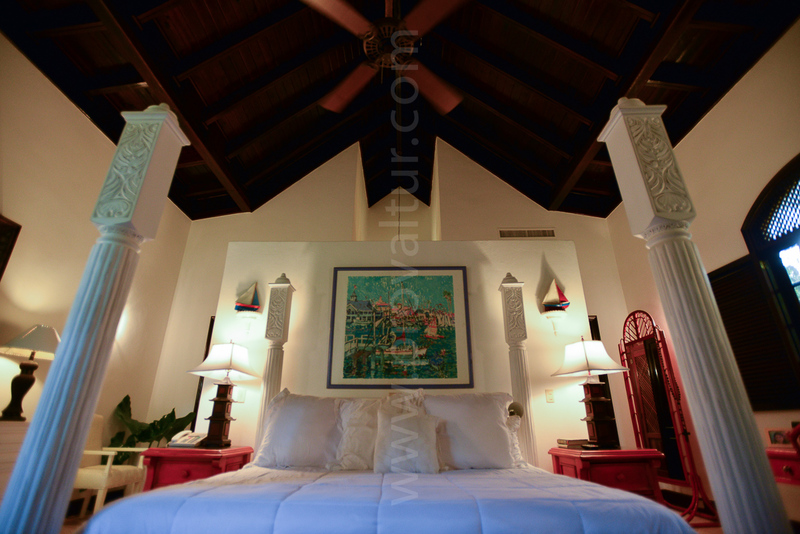 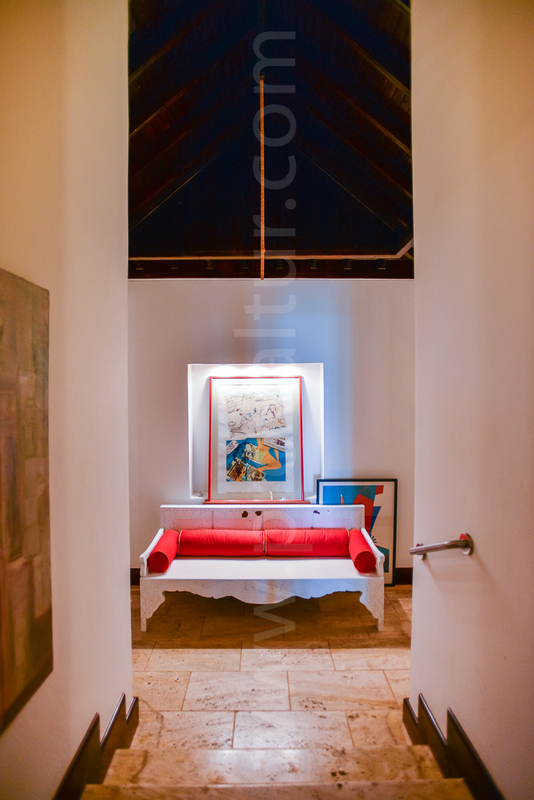 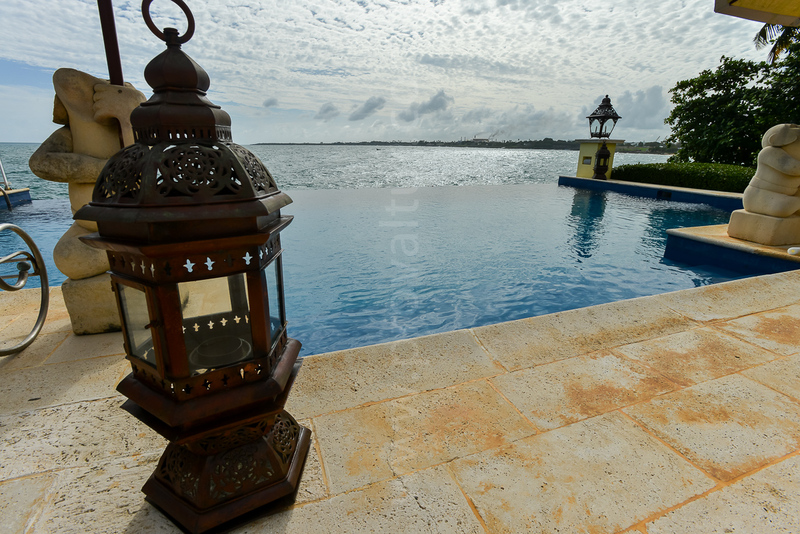 This Casa de Campo villa is the perfect vacation retreat and would make a beautiful home for a family or couple. 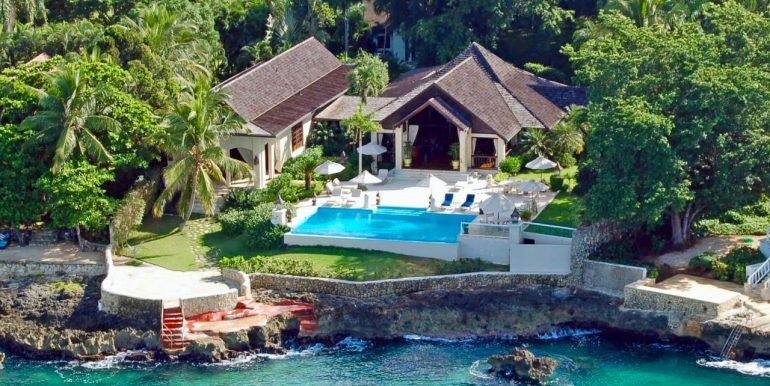 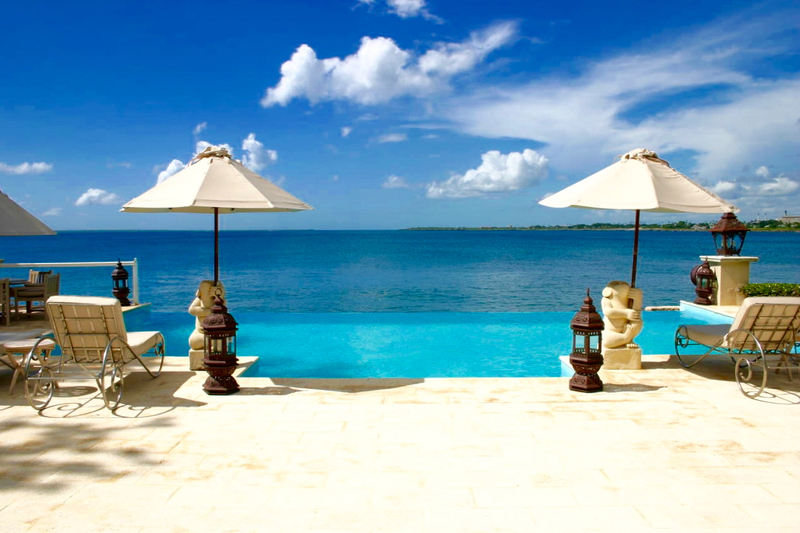 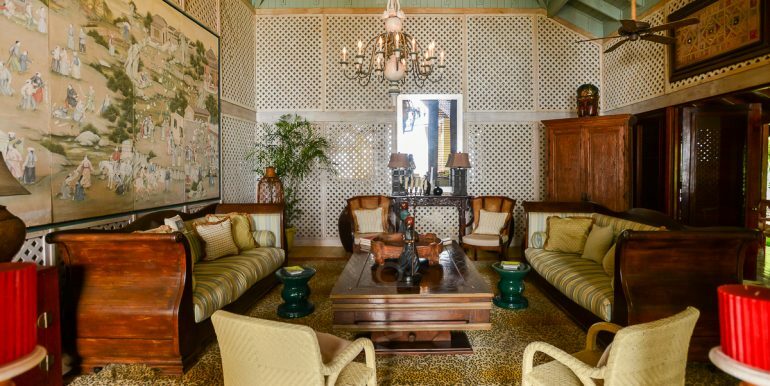 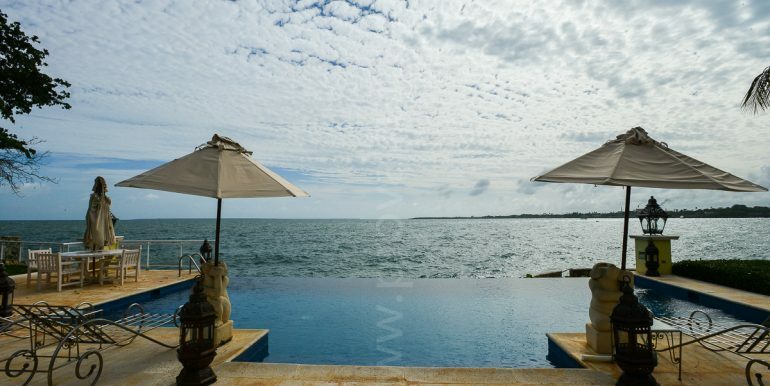 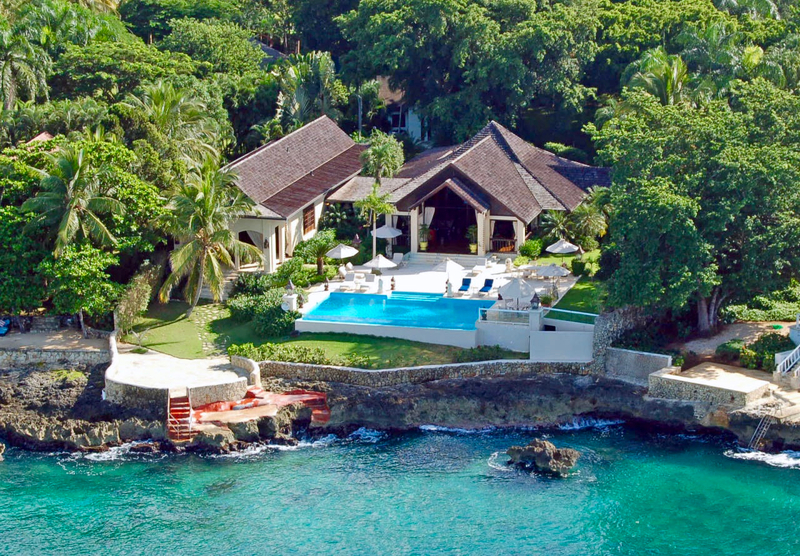 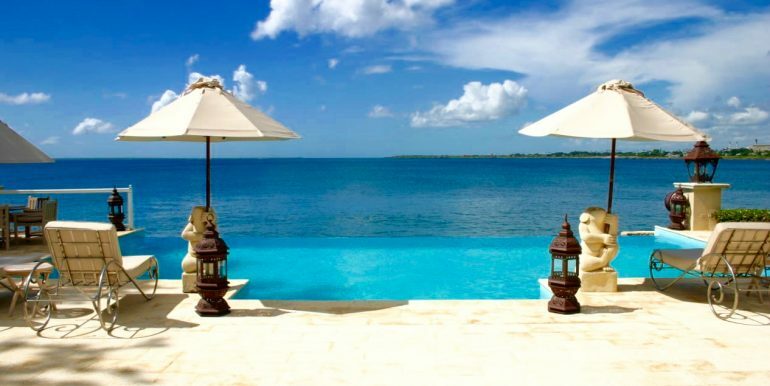 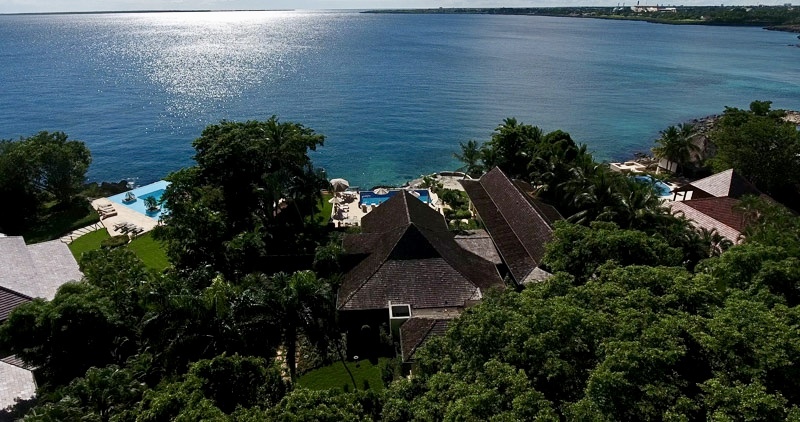 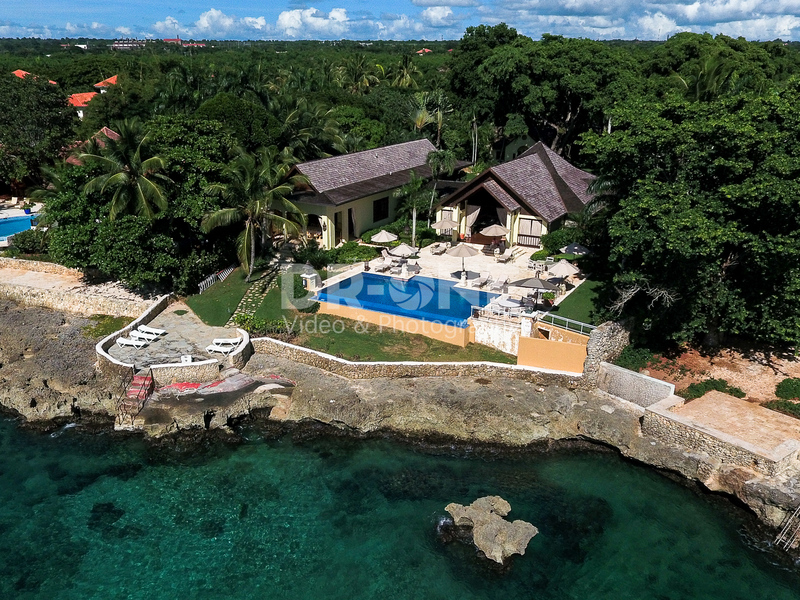 This spectacular Casa de Campo villa is a new addition to the Casa de Campo Real Estate market and with it’s enviable ocean-side location, unique Balinese-style architecture and luxurious rooms – we can expect this Casa de Campo villa to go from ‘for sale’ to ‘sold’ pretty quickly! 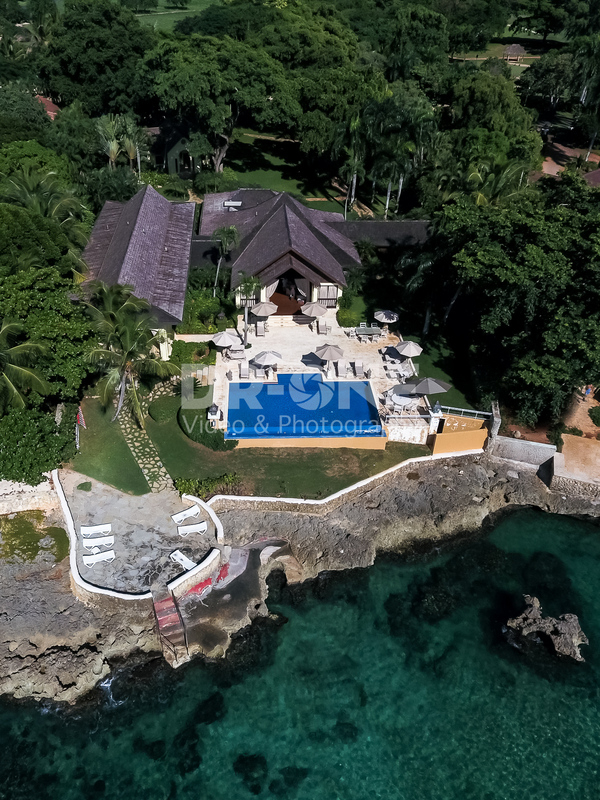 By our calculations, Casa de Campo currently has less than 5 ocean-side villas available on the real estate market and the luxury of being able to enjoy sunbathing, dining and relaxing, right next to your own private piece of ocean is in high demand. 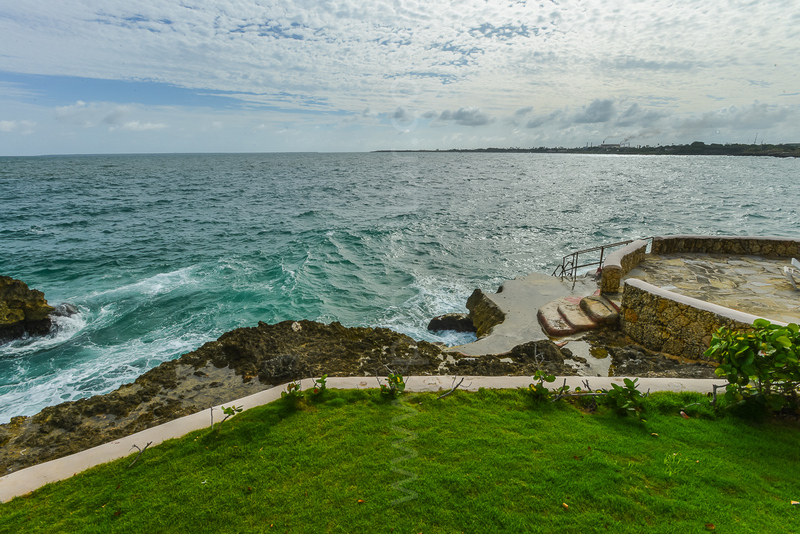 From the lower sunbathing terrace, on a calm day, sunbathers can climb down stairs directly into the water and cool off in the sea. 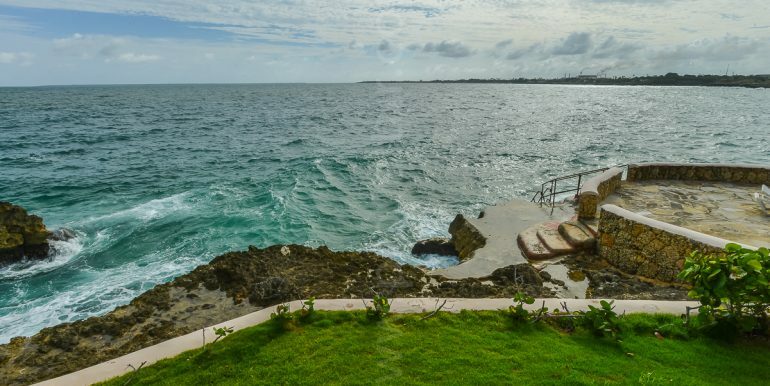 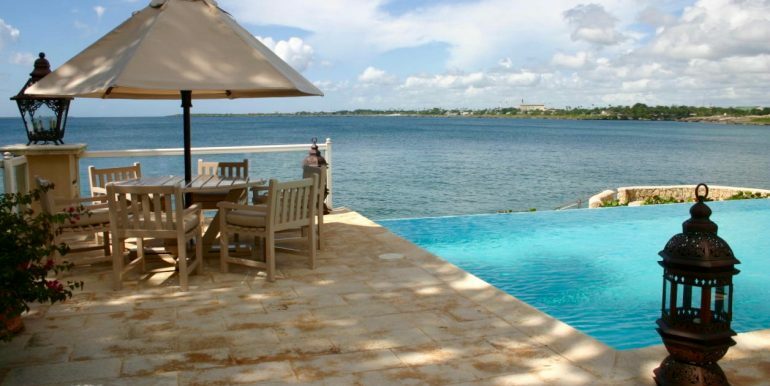 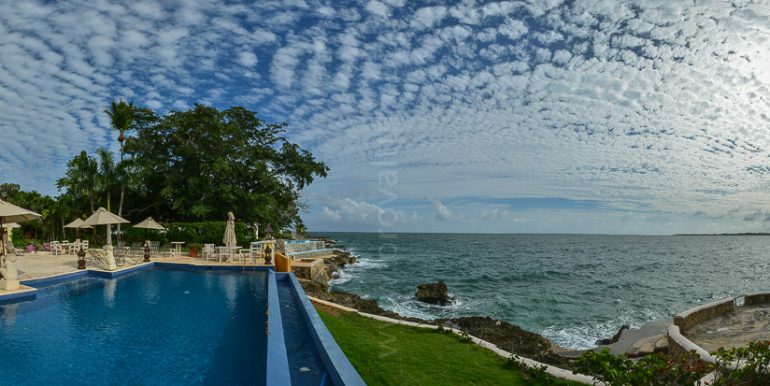 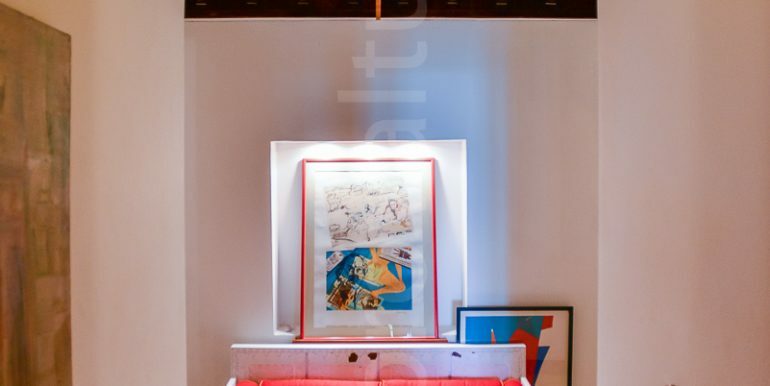 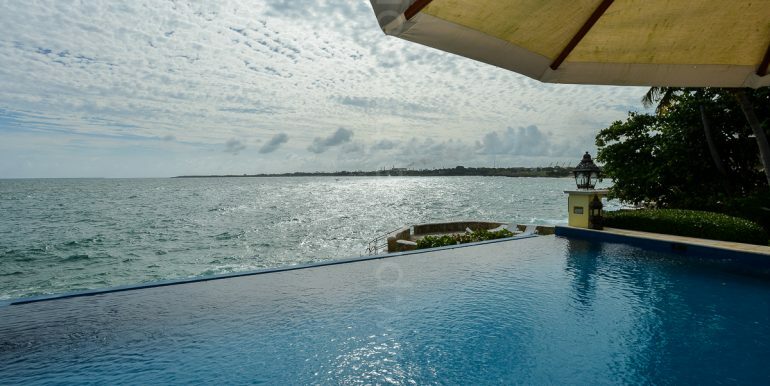 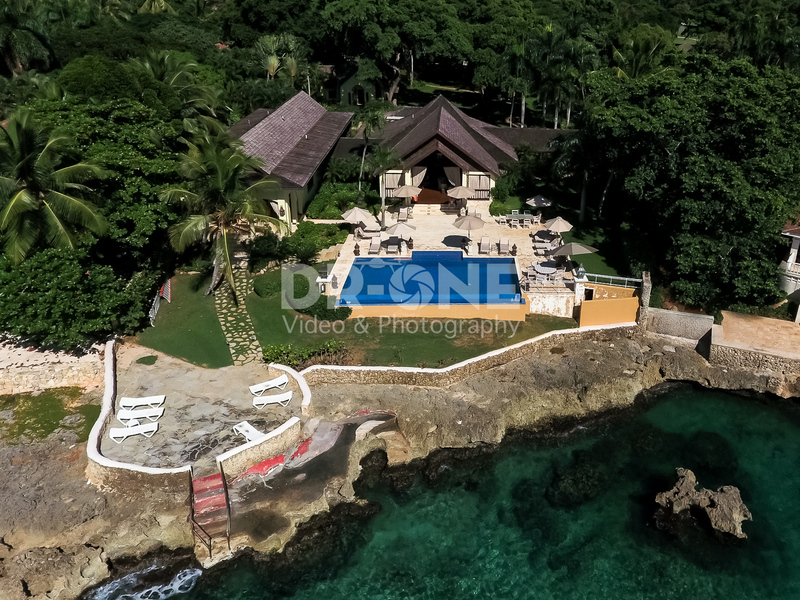 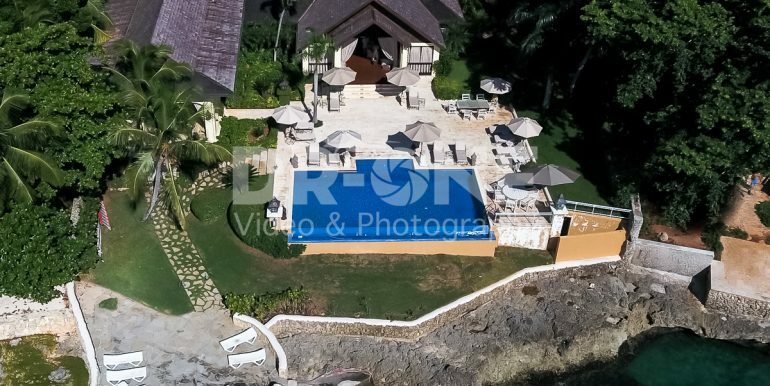 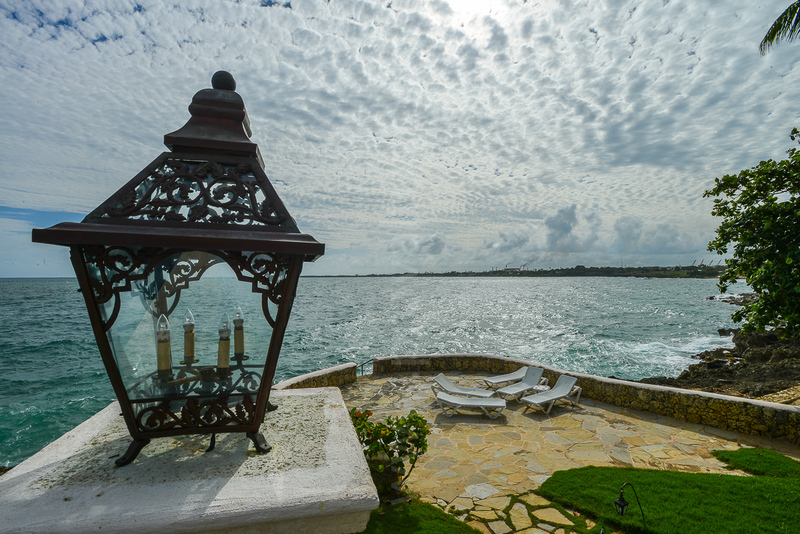 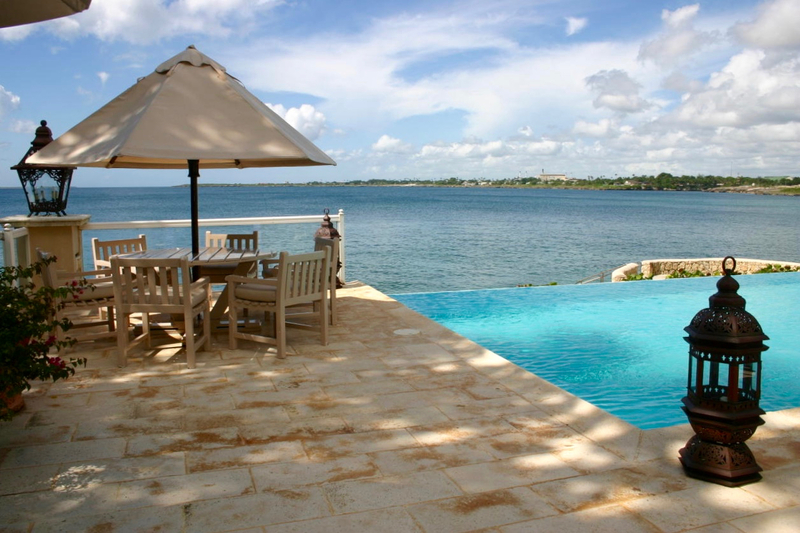 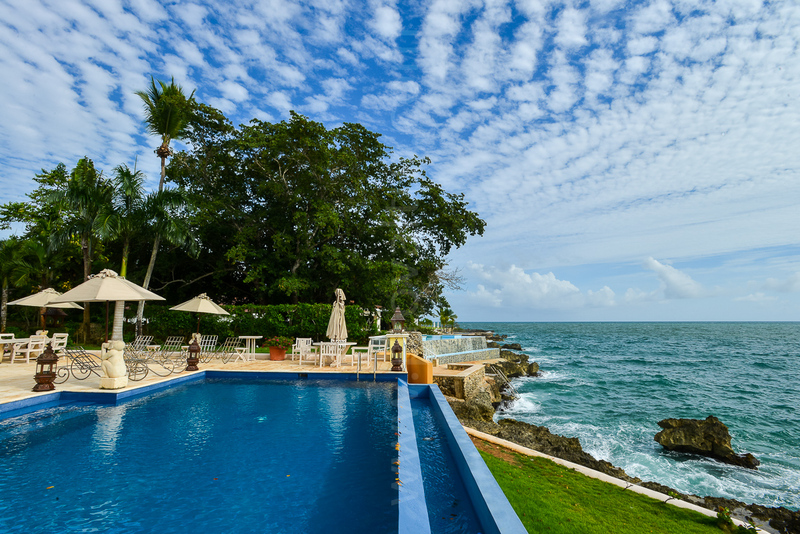 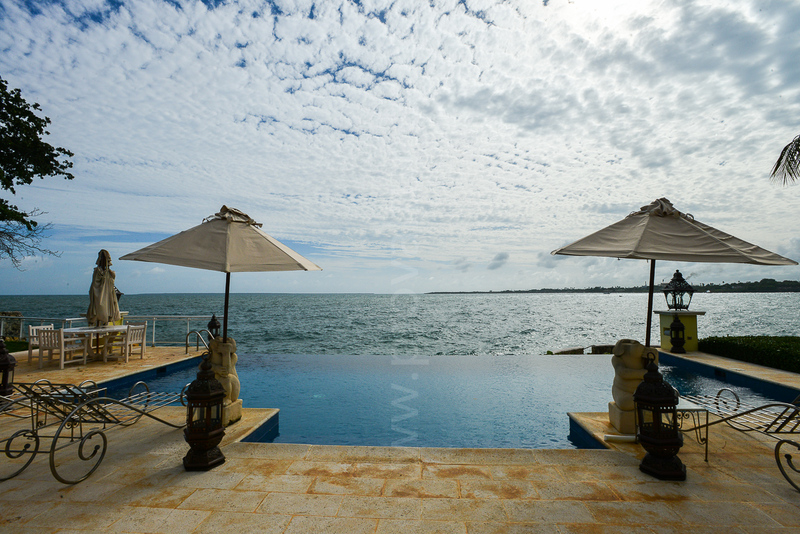 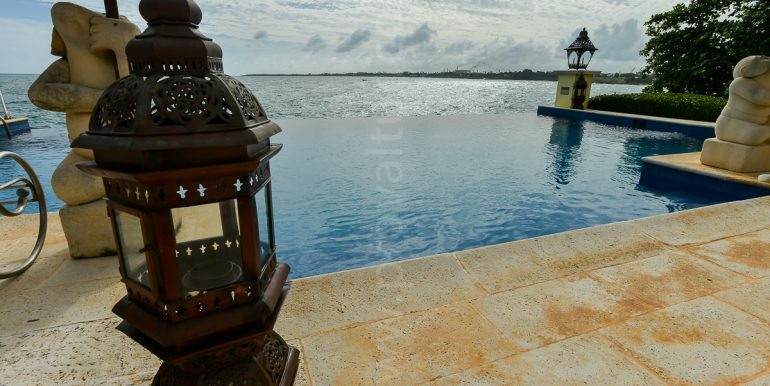 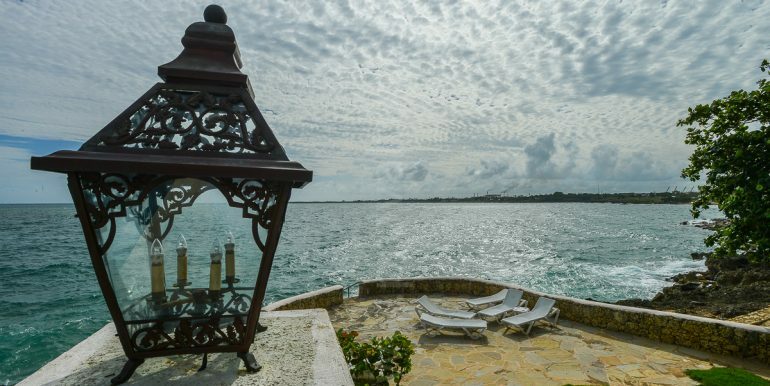 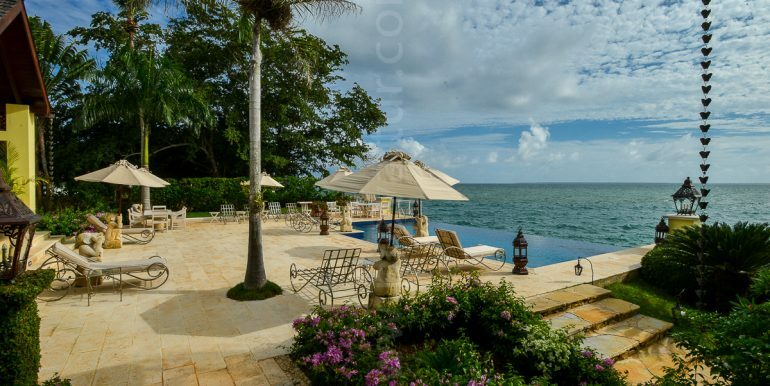 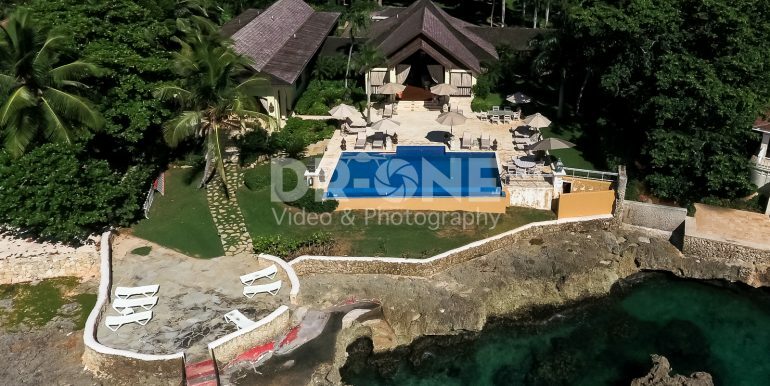 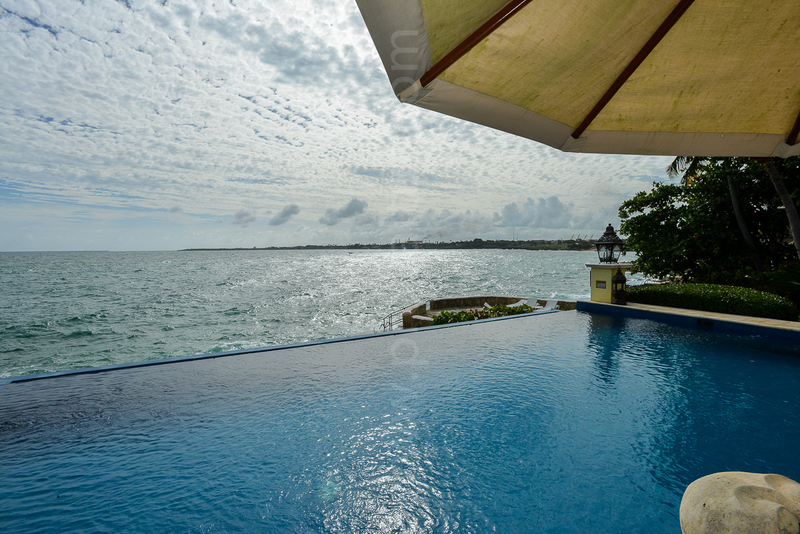 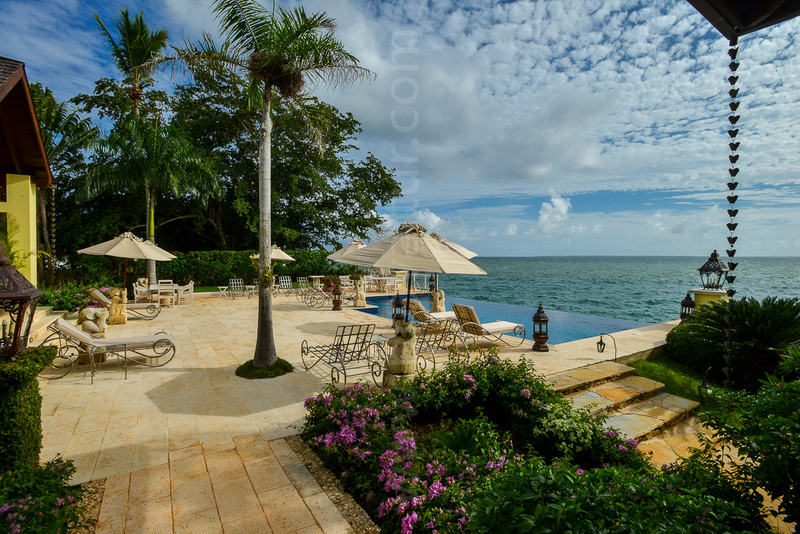 Located within Casa de Campo Dominican Republic in the exclusive neighborhood of Punta Aguila, this villa will provide it’s new owners with privacy, tranquility, a stunning view of the sea, as well as an address which will be the envy of their Casa de Campo friends! 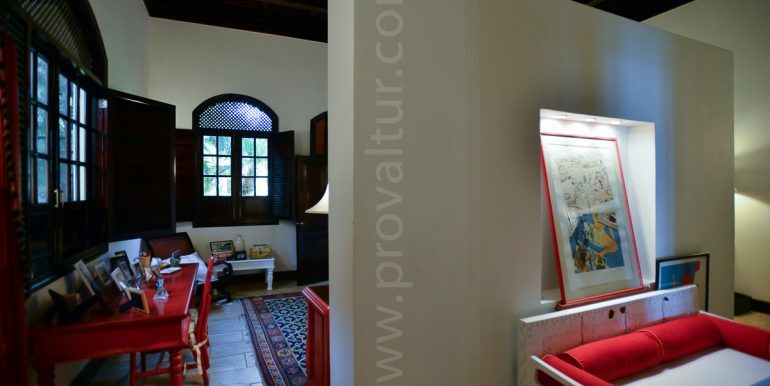 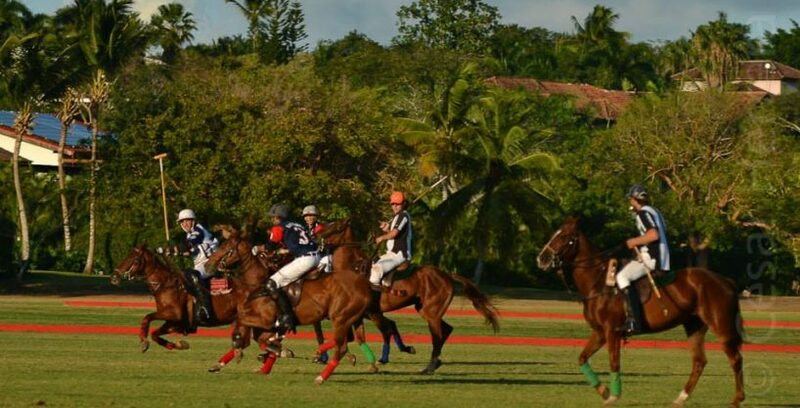 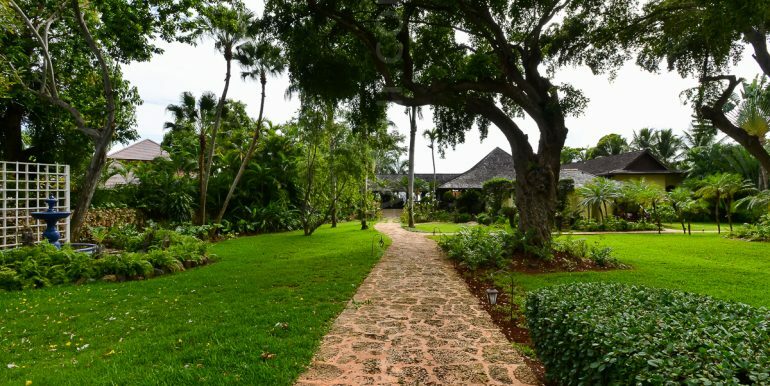 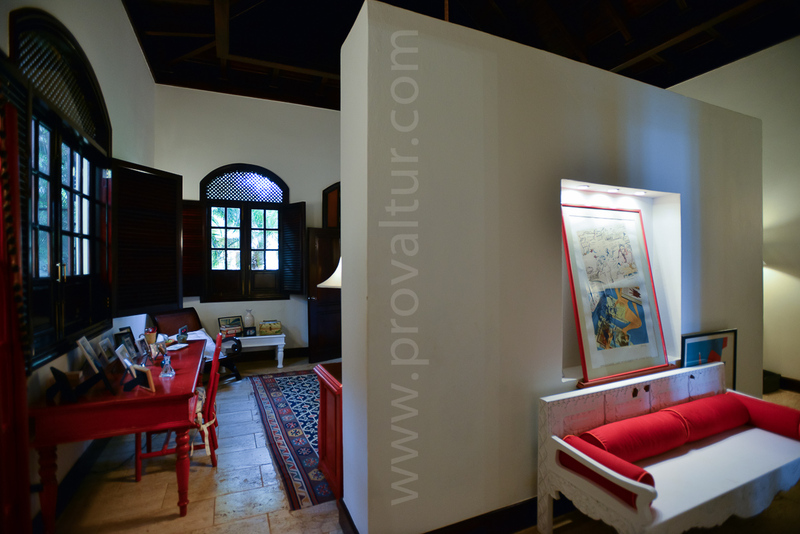 Punta Aguila is one of the oldest areas of Casa de Campo in the La Romana region of the Dominican Republic, with many of the homes owned by residents who have been living in Casa de Campo or at least spending their vacations in Casa de Campo for as long as 30 years. 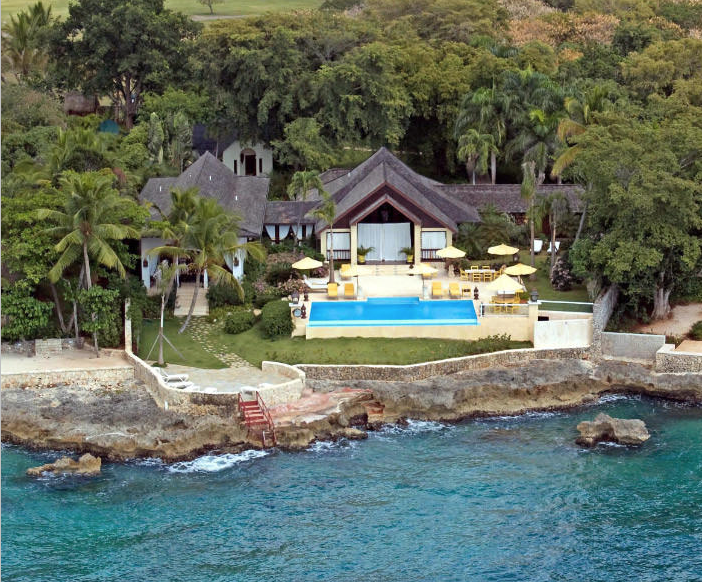 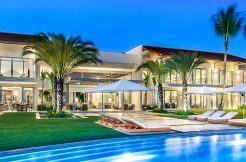 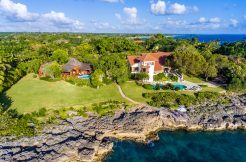 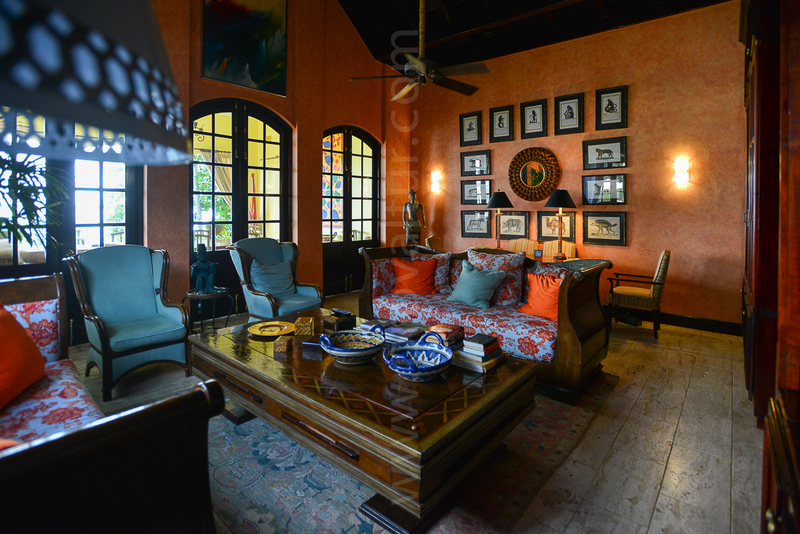 Punta Aguila is also one of the most expensive areas of Casa de Campo, with villas historically selling for US$15 million and more!